The service is still in development. Currently it has a server based generator and client apps for mobile phones. It is able to trade on the server on a Demo environment and provides signals for MT by using a bridge. The future development will offer full server side strategy execution on real accounts. The app works with a predefined Reactor on about 20 symbols provided on the cloud. Currently the app is nothing more than a toy, but if it gains some popularity, we can expand it to the full power of EA Studio. WOW! This looks really super. 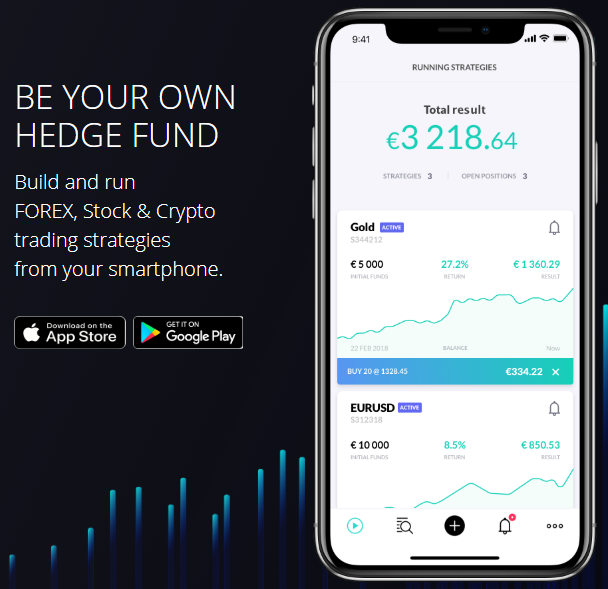 Cool, there are a number of newbies when they want to try out forex, they also search out for forex apps in mobile device and hence, this app is a good "advertising" tools to introduce them to FSB Pro or EA studio. Hence, do put your FSB website link somewhere to capture the "leads" (those who are curious enough to venture) divert them to FSB for other product explorations. Tempt them with more tools. Cos I believe anyone who are serious enough to go into forex will eventually proceed further into FSB Pro or Studio. And hence by providing them with the extra links to FSB, you would have capture potential customer and also spare them the efforts to search all over the internet to find FSB. I consider myself "fortunate" that I somehow "landed" into FSB website, many years ago when FSB didn't "pop" up so easily in google search. I am amazed by this thing! Well, I was so surprised when you announced it.. and even more surprised by what it can do! This is simply a “Huge” step!!!!!! Popov, you keep surprizing us with ur skills and ideas!!!!!!!!!!! Wow, what a great news. Please allow more historical data as the signals are not stable enough. for 30 min signals. Some users prefer >5-30 years history. minimum number of trades to 100 is very difficult. I understand stoplosses can work against you but no stoploss is also risky. or ForexSB. This was a nice start. My account has been doing well since I started to use it..... Considering I put no effort into the strategy, I am quite pleased with this app. like these with common indicaters can still consistently produce good results. machinelearning and simpler things are less likely going to work in the future. pattern logic could help like current high is higher than previous top etc. Are you oke with only a couple of months history on 5-30 min timeframes? Sometimes we fall in love with the complexities and justify their necessity. Strategies with two or three indicators still do ok, the markets may change their face bit the simple strategies still work well. No matter the price action a moving average has a lot of utility and as long as trend is well defined a simple strategy will give a great return. work well for you? Do you allow systems that do not have a stoploss? OOS is a different story. used to work several years ago are now a different story. that has a stoploss of >50k. end of in sample and the %/per trade, no of trades, draw down, linearity and profit/drawdown. curve IS I trust these ones more OOS. I still think a couple of months of data and few trades could cause curve fit in ProQuant. I also can't set minimum profit per trade to less that 1% as the scrollbars are not precise enough. and it would need more history and generated systems per search. But for a free app it is great start and I can't ask too much. I guess I have to trial Studio and ForexSB. You have definitely try them. ProQuant uses the very same engine as EA Studio but because it is designed to work on a mobile phone it provides limited controls. Some day it may be possible to share strategies between the apps and it will make a huge difference when it become able to trade on the cloud. This was our initial goal, but it appeared that the life trading integration will take more time and we decided to release the app as it is now. Later it will not be necessary to use MetaTrader at all. With what broker/data works proquant? Is cost of trading included in the profit of proquant? When I first downloaded it, I was pushing whatever buttons and it optimized something and then started to trade. Now the account is up 20 percent since April 4, fairly good! One day I best figure out what it is doing. I had some good results but they almost all fail because the logic of the exit. for a long exit, in a big selloff there will be almost never be a cross there. the system to my surprise but OOS it failed. But apart from that it was surprising how good the entries often were. of them have these risky exits. Is this also the case with Studio? Proquant.com is down. Any update when it will be back up again. The app is amazing! - possibility to edit the strategies. Hi, If I activate automated trading on an EA that's already have 1 open trade on my account (phone), do this EA can open new trade on my MT4 account without waiting the trade on the phone to be closed ? I want my Phone and MT4 account to be sync in opening of new trades and that seem to not be the case . The ProQuant expert is a trade copier. It will clone your positions in your MT. Depending on how many strategies you are running via your ProQuant app, it may happen that each running strategy to open a position. If you do not stop the expert or change the magic number, the accounts must be in sync. If you experience any discrepancies, please contact the ProQuant support.